Gasoline or gas (North America) or petrol (Commonwealth countries) is a fuel derived from petroleum, which is in turn generally thought to be derived from ancient vegetable matter. Gasoline is an aliphatic hydrocarbon, or the molecules are composed of nothing but hydrogen and carbon in long chains. The energy contained in a gallon of gasoline is approximately 132x106 joules of energy, equivalent to 125,000 BTU or 36,650 watt-hours. This high energy density allows for much of the modern industry and comforts of the modern world through the transportation of goods and people. Gasoline is refined from crude oil via distillation. Gasoline is sold at gas or fueling stations where it is pumped into vehicles. According to national figures from the U.S. Department of Energy, in May 2007, 46% of the cost of gasoline went to pay for crude oil, 28% for refining, 13% to taxes, and 13% for distribution and marketing. 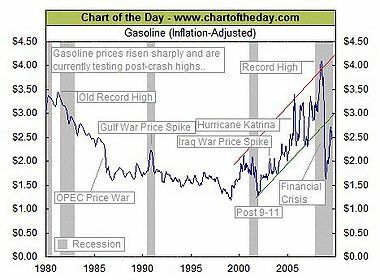 While prices have risen to new highs, in inflationary terms, gas prices are still lower than during the 1973 Energy Crisis or the 1979 Energy Crisis. This page was last modified on 28 June 2016, at 09:15.